Who would expect such a brilliant inner courtyard of a hotel, kind of hidden in a side alley in the 7th district of Vienna? Not me, my colleagues or friends- and so we were all more than happy when we kind of stumbled upon Hotel am Brillantengrund, which really turned out to be one of our favorite places last summer! 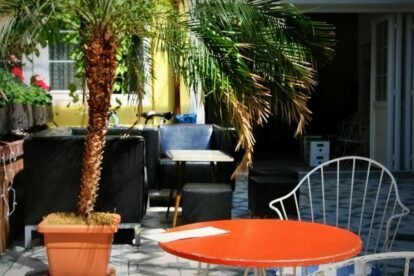 The neat and recommended 3* hotel (with “old-school” furnishing), outdoor restaurant for summer time and arty bar for autumn is run by some really nice young fellows. It all is very intimate, family-like and full of art & antiques! The Philippine mama is cooking, a young guy is making some of the best and freshest cakes in town and service is friendly and very easy-going. In summer: hang out on the sofas or on the 1950s garden furniture beside palm trees, watch hotel guests walking along the row of balconies with flowers and plants. In winter: enjoy the simple garage-like bar or the weird “old-school meets modern art” restaurant. See artists and neighbors dropping by and contemplate why this place is literally called brilliant estate/diamond place. (And I’ll tell you why: not because it’s such a lovely jewel of a place, but as this area used to be a posh and rich district about 200 years ago…).